I have so many deadlines at the moment and I 100% hate that my blog is on the back burner right now but there's not much I can do. I am hoping as I begin to finish some of my modules that I'll be able to focus on my writing a little more. Anyway on to today's post I thought I would talk a little about the products i've been reaching for on a daily basis. Starting off with my base the Stila one step prime and nourish primer is one of my all time favourites especially when I'm having a super dry skin day. Foundation wise I love Lancome teint idole ultra wear, it's super high coverage but isn't cakey at all. 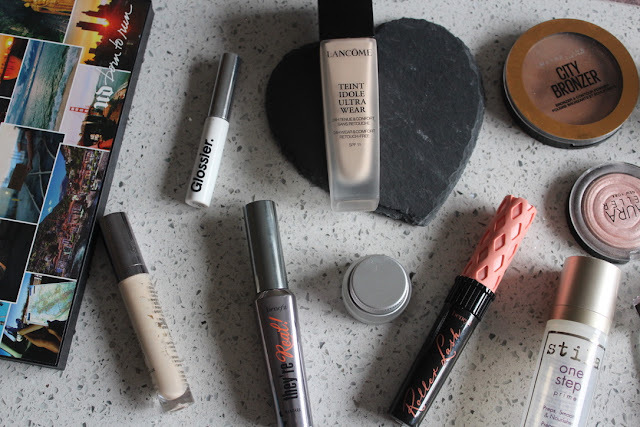 A lot of high coverage foundations look super dry on my skin where as this sits really nicely. Urban decay's naked concealer is still my go to out of my collection. Again it just sits super comfortable on the skin and doesn't crease which is a massive problem I have with a lot of concealers. 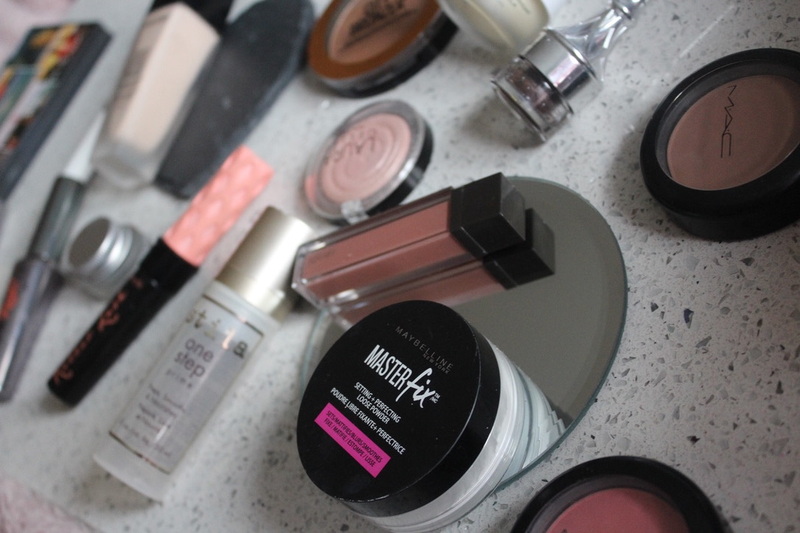 Finally for my base I cannot put the Maybelline master fix powder down. It is by far the best drugstore powder I've tried. For the rest of the face I've been using a couple of Mac blushes first off I've been using Harmony to add some contour to my skin then for some colour i've been using Fleur power which is a gorgeous natural blush shade. 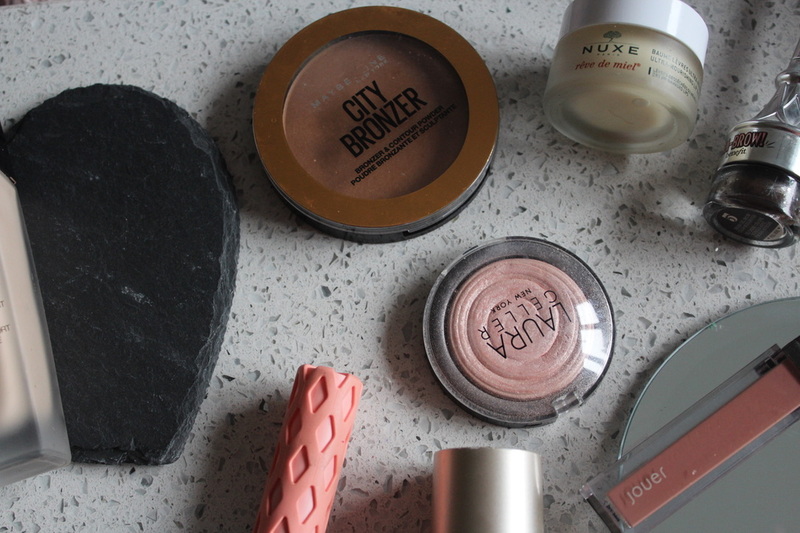 Bronzer wise I've been using the new Maybelline city bronzer which I absolutely love. It gives the skin the most stunning healthy bronzed glow. Finally for the skin i've been using Laura Geller Charming pink gelato swirl illuminator. Brow wise I've been reaching for Benefit Kabrow over my Anastasia dip brow, I find its a little deeper than the abh and since having my brows re tinted I've just found it matches me better. As always i've been reaching for Glossier boy brow. Eyewise I love the Urban Decay born to run palette, it's such a massively versatile palette and you can do everything from a matte basic look to a bright blue/green look. I recently picked up a new Maybelline gel liner and i've been using it a lot both in the waterline and on the top. The mascara wise I've been using They're real from Benefit. Finally i've been reaching for the Jouer matte lips which I love, they're super comfortable and the shade range is really lovely. So that's for today, I'd love to know what you've been using recently. 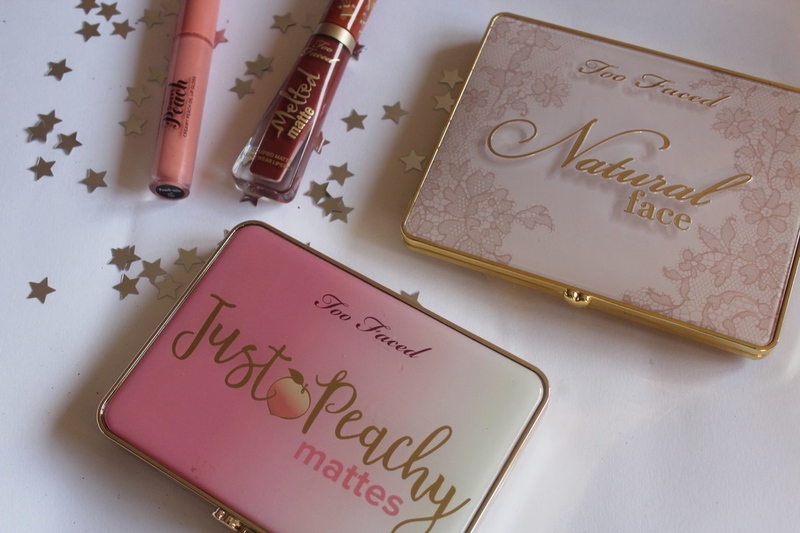 Too faced is everywhere at the moment and now you can get it so easily in the UK I had to try some products from them. 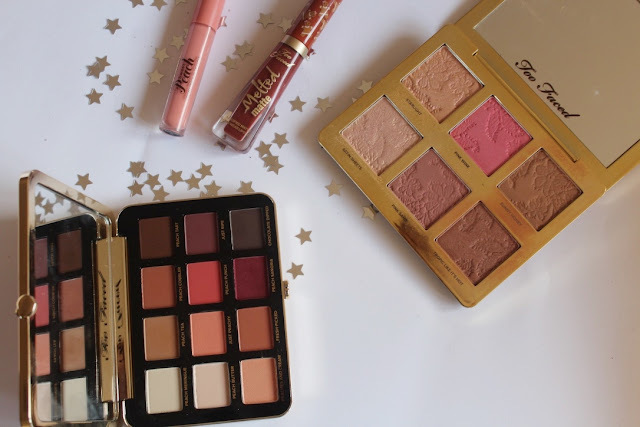 I am very interested in the base products from the range but initially I thought id try out some of the powders and the lip products. Starting off with Eyeshadow we have the Just peachy mattes palette. As soon as I saw this was being released I knew I wanted it and I finally managed to get my hands on it at Christmas. For me this is an amazing everyday palettes as I love peachy shades. These are really beautiful quality shadows and even though they're super pigmented they aren't powdery at all which I know some people have a huge issue with. I love the range of shades and just think it's perfect for if you want an everyday peachy shades. The Natural Face palette again is another amazing everyday product. The powder are rich and buttery but not too pigmented. The highlights are so beautiful and glowy, the blushes sit really nicely on the skin and although they look pretty bright in the pans they aren't too bright on the skin. The bronzers are my favourite products out of the three sets of products. They're very warm, but I love them they warm up the face beautifully. They have a little bit of shimmer in them which just gives the skin a very healthy and glowy look. Lip product wise I am obsessed with the Sweet peach lip oil in peach fuzz is a really beautiful and comfortable peach lip gloss. I love how this isn't sticky at all yet it doesn't feel drying at all. With it being a lip oil it feels super hydrating on the lips but contains a huge amount of pigment which I love. A lot of more pigmented glosses are uncomfortable but this one really isn't. Finally I tried the Melted matte lipstick in Gingerbread girl which was a limited edition Christmas shade which I adore. It also smells incredible which is always a bonus. These have to be one of the most comfortable liquid lips I've tried alongside the Jeffree Star and Dose of colours ones. It's incredibly opaque and sits beautifully on the lips wearing super evenly and pretty much lasting all day without reapplying. It's been a while, but I'm hoping I'm back for good this time. I've managed to get two youtube videos up and I have one ready to edit and I have plenty off photos pre taken for posts so hopefully I'll be around a bit more. Today I thought I would talk about my favourite thing which is glitter. So without further ado lets get into it. Barry M glitter goals - Queen and Bling bling. Out of every product I'm mentioning today these have the least base pigment especially the lighter gold shade. These are a fairly chunky glitter in a clear base, Bling bling is a cool toned gold shade with a completely clear base where as Queen is a deeper copper shade. This has more pigment in the base than the gold but is still pretty sheer. These are best used as eyeshadow toppers rather than a sole shadow but are super beautiful especially for the price. Essence Metal shock shadows - Stars and stories and Solar explosions. These are so affordable and such incredible quality as with the majority of Essence products. These are the least glittery out of all the shadows I have to mention today but still beautiful. Stars and stories is a cool toned pink with a silver metallic through it. This is one of those products that I reach for when I want a pretty eye look but I can be bothered blending for hours. Solar explosions is a very light more cool toned light gold shade. This one isn't quite as metallic as the pink one so one I reach for regularly on an everyday basis. 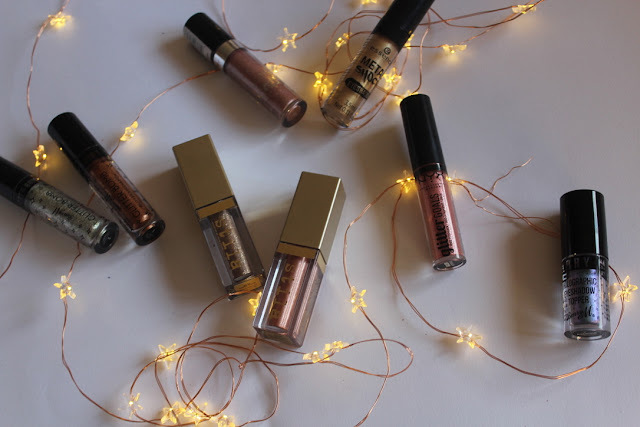 Barry M Glitter goals Bling bling and Queen, Essence metal shock Stars and stories and solar explosions, Stila Glitter and glow Smoky storm and Rose gold retro, NYX glitter goals Metropical, Barry M Asteroid. Stila Glitter and glow shadows - Smoky storm and Rose gold retro. These are the original liquid glitters and the ones that made me fall in love with this kind of product. I am seriously proud of myself for only owning two of these as I would happily spend my entire student loan on them. They have more of a base shade to them than the Barry M ones and are definitely more glittery than the Essence ones. Smoky storm has a slight bit more glitter than Rose gold retro but in terms of the actual shade the rose gold one is definitely my favourite. 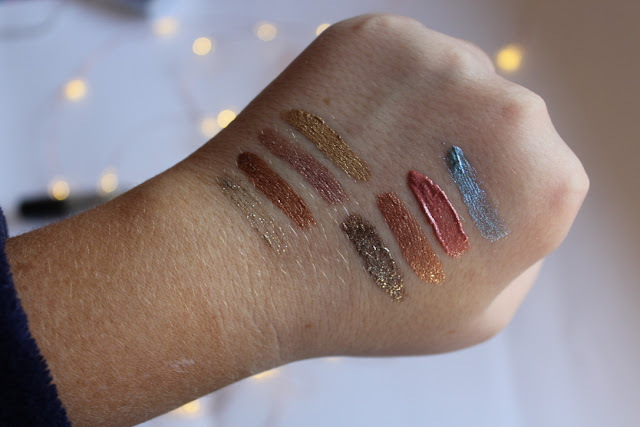 NYX Glitter goals - Metropical. These are a new release and definitely the closest I've found to the Stila ones so far. In the swatch it looks more like a simple metallic shadow however once on the eyes the glitter is much more obvious. There are a couple of brighter shades in the range however the range is no way near the Stila one. That being said if you can't get your hands on the Stila ones I'd definitely give these a go. Barry M Holographic eyeshadow topper - Asteroid. This one is a little different from the rest but I wanted to mention it as they're so pretty. There is a little glitter in this however it's more focused on the duo chrome side of things. The range is mostly focused on blues and greens and I do wish they had some different shades as they look amazing on halo eyes. Out of all of the products I've mentioned today I really hope they expand this range. So that's it for today, I'd love to know what your favourite glitter shadows are.